Developed by DYMO to meet virtually all your labelling needs in an office, workshop or retail environment. These tapes will ensure long-lasting, high-quality labelling. Resistant to water, oil and will stick to most surfaces including paper, metal, wood or plastic. 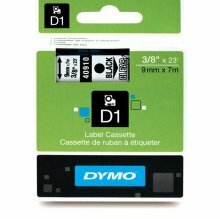 Compatible with LabelManager, LabelPoint and LabelWriter DUO Labelprinters and old DYMO Labelprinters using D1 tapes.